11.4 cm, 4 1/2 in. The Oriental Ceramic Society is pleased to announce a special preview of highlights from Sotheby’s Spring auction led by Nicolas Chow, Chairman of Sotheby’s Asia and International Head and Chairman of the Chinese Ceramics and Works of Art Department. 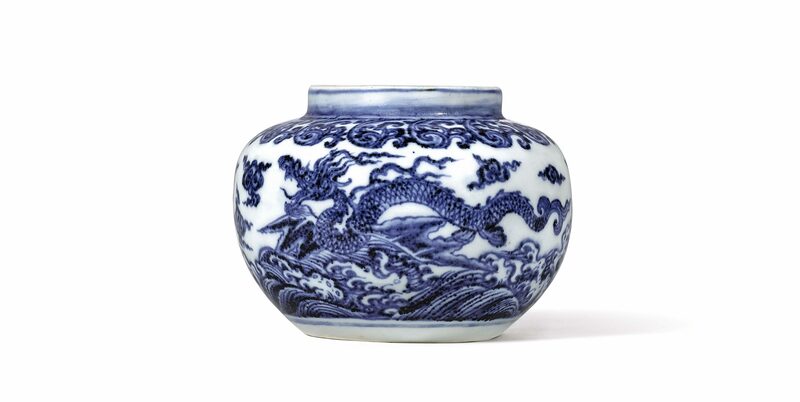 Among the highlights is the sale of selected imperial blue and white ceramics from the Tianminlou Collection assembled by Ko Shih Chao. Also on display are works from The Robert Youngman Collection of Chinese jade. The history and background of these works will be discussed alongside other highlights. Nicolas Chow is Chairman of Sotheby’s Asia and International Head and Chairman of the Chinese Ceramics and Works of Art Department, orchestrating auctions with a focus on ceramics and works of art from the Ming and Qing dynasties. Mr. Chow joined Sotheby’s in 1999 and has been responsible for leading the Chinese art market across the Asia Pacific region since 2003. In 2006/07 he took over global oversight for the Chinese Ceramics and Works of Art departments. Members are reminded that this event is strictly limited to current members only and that pre-registration is required. We regret that drop-ins can no longer be entertained as the preview takes place before the public are admitted to the galleries. The event will be cancelled if Typhoon Signal no.8 or above is hoisted or if Black Rainstorm Warning is in force one hour before the event.